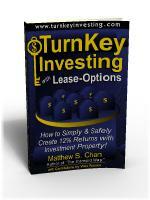 Read the review by Independent Professional Reviewers of “TurnKey Investing with Lease-Options”. 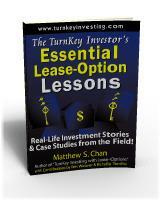 If I were still working, I would be reading TurnKey Investing with Lease-Options as I would an excellent novel! Indeed, I was not only impressed with this book; I was amazed! The main reason for my careful review of this book was that I read it wearing two former hats. One was as the experienced lease manager for a land-grant university but, more importantly, the other as a young single professional woman who had entered into a lease-purchase arrangement when I decided to buy a condo many years ago. Even though I was already managing leased space for the university, when I decided to purchase a condo, I was not prepared for the trauma of having to face a major financial burden with no support. My mother was living with me at the time, but I knew the little money she provided would not continue through the life of the mortgage. 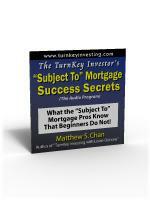 Additionally, although I had been promoted on an ongoing basis, and expected another promotion in the near future, I had no savings or verification that I would be able to meet mortgage payments. Fortunately, my landlord wanted to get the last unit sold in this complex and offered to allow all rent payments to go toward an ultimate down payment on the actual purchase price. If you are in a similar situation—buy this book. It is not necessarily intended for the potential new property owner; however, it provides a lot of essential information you need to know as you consider this option. For instance, for years, I sat in my new condo with nothing on my walls, no pictures, and no decorations—because my landlord had told me this wasn’t permitted. Such a little thing, but I grew to hate those bare walls and, finally, even though feeling guilty, pounded the first nail toward making that house a home! With this book, I would have been in a position to question and negotiate what I could have done in this place I intended to make my long-term home! Indeed, the acquisition of a home via lease option is based upon accepting a home, essentially as-is with the ability to improve and upgrade the building as if it were already owned. At the same time, even though this book is written for a specific geographical area, the philosophy, the management direction, and the presentation itself all provide an excellent learning tool for an individual who has been given any type of property management responsibility, no matter where that property is located. In addition to thoroughly describing lease-options, the book covers how to research the market, purchasing, preparing, marketing and finding the right tenants. The excellent ideas used herein can be easily translated for use in any type of real estate transactions. And, finally, if I were a potential real estate investor, not having already committed to my retirement plan, I would be in contact with Mr. Chan immediately! Why? This book shows exactly what I as an investor need to know to make the decision to consider real estate as an investment. And, what’s more, he proves his claims with sufficient facts and figures that you can believe. That’s a major accomplishment for those who are reticent to invest in anything that has some risk. Mr. Chan’s book is perhaps one of the best written books of its type. Using the traditional training method, he first gives an outline of what he is going to explain and teach and then he repeats each item, both times providing specific details, but also anticipating any questions that might evolve based upon his presentation. You can tell immediately that the author speaks with authority, based upon knowledge and experience, readily confessing to trial-and-error issues. 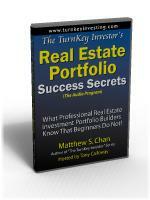 Mr. Chan opens his book with recommendations from those who are involved in considering investment options. By the time you finish the book, you will have gained a certain trust for the company and its team. However, assuming you are not in a position to invest directly with TurnKey Investing, this book provides sufficient details for you to learn about real estate investments. Specifically, the use of conventional financing through a bank, versus private financing, versus seller financing is explained. The author is open and quick to point out that the best financial gain is through the use of cash/private financing. However, the use of bank financing is also explained and the returns of each are explored thoroughly. 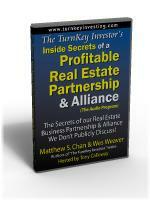 For a potential real estate investor, Turnkey Investing is worth every penny of its purchase price. I think the real value of the book, however, is for those who are interested in getting into the real estate business using lease-options. 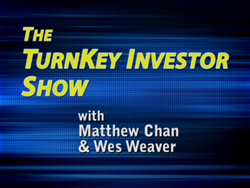 Turnkey Investing defines a market and stays with it—specifically to serve the thousands, if not millions, of people across the United States who wish to own a home but are not able to gain financial backing through the normal process, especially in the early years of their adult lives. Lease-option is an important contribution in today’s world of turmoil and insecurity. It provides a no-lose option to those who are now renting without any future return on those funds. At the same time, it provides an opportunity for houses to move faster on the market and a way by which a landlord or property manager can respond in a cost-effective as well as profitable manner. Finally, as a long-time planner and manager, I was most impressed with this company’s use of Kaisen. This Japanese concept is the belief in making small, ongoing improvements to a business system. A review of their online activities which allows practically everything to be done online to apply for a home, the use of a hot-line as a means of dispensing valuable information and basic management decisions to expedite efficient use of their teams’ time is a delight to see in practice! Even if you have absolutely no interest in real estate, if you are a planner or manager, study the book to absorb what can be learned from this efficient and effective team! 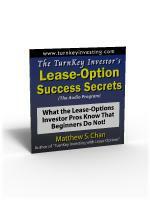 The TurnKey Investor’s Essential Lease-Option Lessons as well as CD audio programs and a Documents Collection supplement this book. 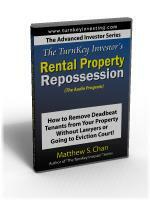 However, this first book, TurnKey Investing with Lease-Options, easily stands alone as a major real estate manual. It’s a Must Read for property managers, landlords interested in upgrading their activities, as well as real estate agents, lease managers and others who are interested in this major and profitable business!